The Soyuz MS-08 spacecraft carrying NASA astronauts Drew Feustel and Ricky Arnold, and Oleg Artemyev of the Russian space agency Roscosmos, lifts off from the Baikonur Cosmodrome in Kazakhstan at 1:44 p.m. EDT on March 21, 2018 (11:44 p.m. Baikonur time). The crew is scheduled to dock to the International Space Station at 3:41 p.m. March 23, 2018. Two NASA astronauts and a cosmonaut are on their way to the International Space Station (ISS). Americans Drew Feustel and Ricky Arnold and Russian Oleg Artemyev launched aboard a Russian Soyuz spacecraft from Baikonur Cosmodrome in Kazakhstan today (March 21). The craft was carried skyward by a Soyuz rocket, which lifted off at 1:44 p.m. EDT (1744 GMT; 11:44 p.m. local Kazakhstan time). When they get there, the trio will boost the station's population to its full complement of six crewmembers. At the moment, the ISS is occupied by cosmonaut Anton Shkaplerov, commander of the current Expedition 55; NASA astronaut Scott Tingle; and Norishige Kanai of the Japan Aerospace Exploration Agency. Feustel, Arnold and Artemyev are all veteran space fliers. Arnold flew on the STS-119 mission of the space shuttle Discovery in 2009, and Feustel has two shuttle jaunts under his belt, including STS-125, the final Hubble Space Telescope servicing mission. That flight lifted off in May 2009, aboard the orbiter Atlantis. Artemyev has been to the ISS once before, spending 5.5 months aboard the orbiting lab in 2014 as a member of expeditions 39 and 40. The newcomers won't have much time to relax after they reach their destination. For one thing, they'll start helping out pretty much right away on the hundreds of scientific experiments currently underway aboard the orbiting lab. And Feustel and Arnold are scheduled to conduct a spacewalk on March 29, to replace some cameras and install wireless antennas on the station's exterior, NASA officials said. Expedition 55 crew members Drew Feustel of NASA (left), Oleg Artemyev of Roscosmos (center) and Ricky Arnold of NASA (right) pose for a crew portrait at the Gagarin Cosmonaut Training Center in Star City, Russia on Feb. 21, 2018. 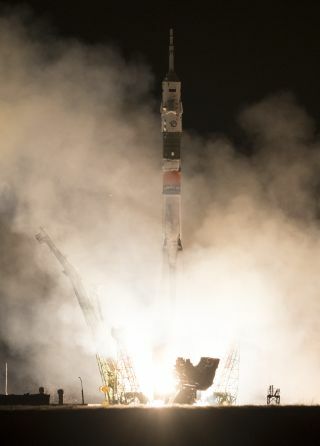 The crew launched to the International Space Station on a Soyuz rocket March 21. The crewmembers will also soon welcome a robotic visitor to the ISS — SpaceX's uncrewed Dragon cargo capsule, which is scheduled to launch toward the orbiting lab on April 2. The Soyuz has been the only astronaut ride available to and from the ISS since the space shuttle fleet was grounded in 2011. But that could change soon. Both SpaceX and aerospace giant Boeing are developing astronaut taxis under multibillion-dollar NASA contracts, and these vehicles may be ready to start crewed test flights before the end of the year, representatives of both companies have said.